This student lesson planner is designed to guide your high schooler into taking charge of his education. 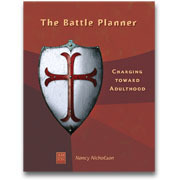 Students should use the Battle Planner not only to keep on top of academic assignments, but also family and extracurricular activities as well. In addition, the planner includes useful, encouraging tips for improving study habits and maintaining a positive approach to life. Each week in this "over-sized planner" is laid out as a full two-page spread with lined spaces to enter assignments, their due dates, family responsibilities, and check off boxes when completed. 36 weeks. 74 pgs. Spiral-bound for ease of use. 8½"x11"